It seems as though Q&A network Stack Overflow has put the $6 million in funding it received back in May to good use, crossing the 10 million unique monthly visitor mark as of yesterday. While Q&A sites like Quora bank on the winning model being one big monolithic site, Stack Overflow is showing success by carefully separating the Q&A game into different communities, launching 34 different sites on topics as diverse as Bicycling, Cooking and IT Security. The company had only three fulltime developers before its first round of funding, which included rockstar angel investors like Ron Conway, Chris Dixon, Naval Ravikant and Caterina Fake. Since then founders Joel Spolsky and Jeff Atwood have hired 24 new employees including Stack Overflow power user Marc Gravell. Despite (or because of) its programming roots, Spolsky tells TechCrunch that the company’s biggest accomplishment in the past six months has been building Stack Exchange, which allows users to suggest new verticals for Stack Overflow-style Q&A sites like Chess, Aviation and Cryptography. This is a savvy move, as using a consensus model to decide which sites get built ensures critical mass upon arrival and high quality answers like this one. 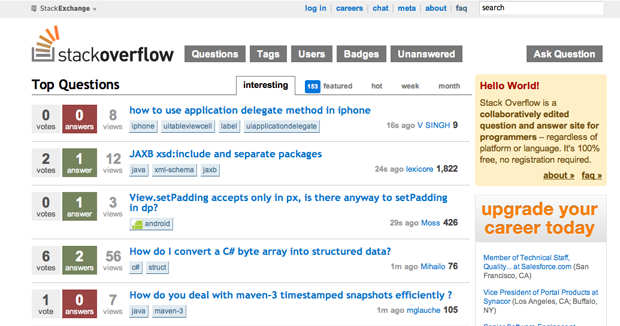 Stack Overflow traffic has soared, going from 6 million to ten million uniques in six months (it took two years to get to the first 6 million). Says Spolsky, “Almost every programmer in the world knows Stack Overflow and visits regularly, usually because we have the answer to a problem they’ve typed into Google–and the new Stack Exchange sites are starting to spread rapidly beyond the initial audience of programmers.” In my experience, things that have massive traction with coders often pick up mainstream and viral tread, as programmers spend the most time online. Case in point: The new Stack Overflow vertical sites have only been up for a couple months but are already showing 33% monthly growth according to internal metrics. Aside from traffic, success is based on a variety of criteria, the most important of which is the percentage of site questions that have at least one up-voted answer. Spolsky says that all of the new sites have 90-100% answer up-vote rates. The network also recently received a small and mostly symbolic $50K spike of funding from Jason Cohen and Dharmesh Shah and just released a bunch of new features including a Campire-like interactive chat. 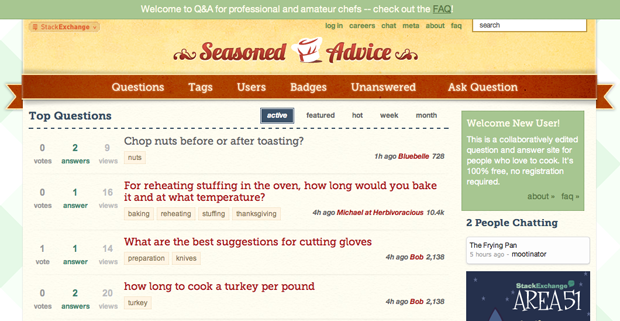 May the best Q&A site (or sites) win.